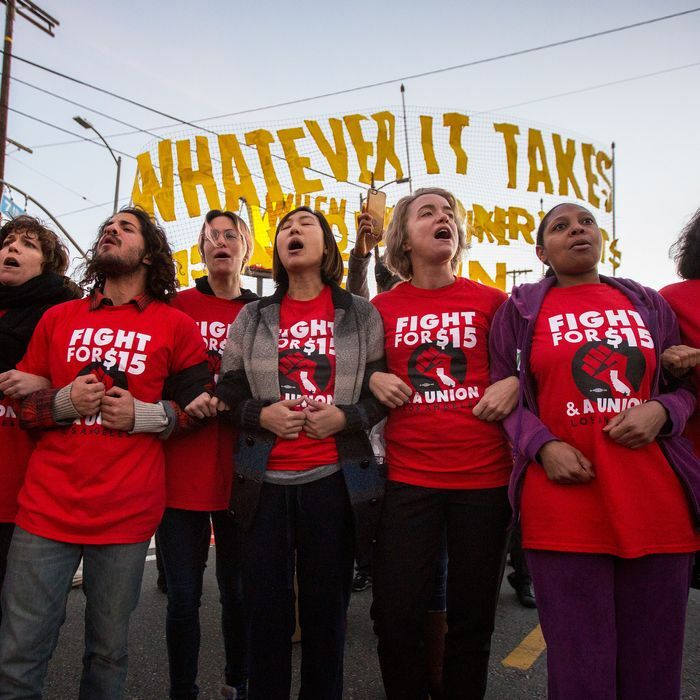 In November 2012, fast food workers across the United States walked off their jobs to demand a living wage. This spurred a raft of minimum-wage hikes in major American cities — and many heated arguments among economists about whether such measures would help or hurt the working poor. Some (typically conservative) policy analysts insisted that raising the wage floor would lead employers to cut staff and hours, leaving those on the bottom rungs of the labor ladder even more cash-strapped than they were before the government intervened. Other (typically liberal) technocrats argued that effects on unemployment would be minimal, and could even be positive: The more cash workers earn, the more they’ll spend — and the more workers businesses will have to hire to keep pace with demand. In the first six major U.S. cities to raise their minimum wage above $10 an hour, workers’ earnings went up while job growth held steady or improved, according to a new study from Berkeley’s Center on Wage and Employment Dynamics. Drawing on data from the Labor Department, the economists found that across the six cities studied, a 10 percent increase in the minimum wage boosted weekly earnings in the food services industry by an average of between 1.3 and 2.5 percent (depending on which economic model they used) by the end of 2016. Meanwhile, their models pegged the wage hikes’ impact on jobs to a range of 0.3 percent reduction (i.e. negative but tiny) to a 1.1 percent increase. Berkeley’s researchers had reached similar conclusions in a 2017 study of a higher minimum wage’s impact solely in Seattle. Then, their findings stood in tension with a University of Washington study that suggested the Emerald City’s minimum-wage hike had actually led employers to cut workers’ hours, leaving many workers with lower incomes. Berkeley’s economists argued at the time that the UW study was riddled with methodological flaws — including a failure to account for the role that Seattle’s employment boom had played in reducing hours worked in lower-wage jobs (by moving workers from low-wage to higher-wage employment). With its new, six-city study, Berkeley claims vindication for its 2017 conclusions. Researchers from the University of Washington, meanwhile, say that the new, six-city study’s findings are valid — but less telling than its authors suggest. It’s plausible that Berkeley’s study doesn’t tell the whole story. But the chapters we’ve currently got suggest that higher minimum wages are a net win for working people. 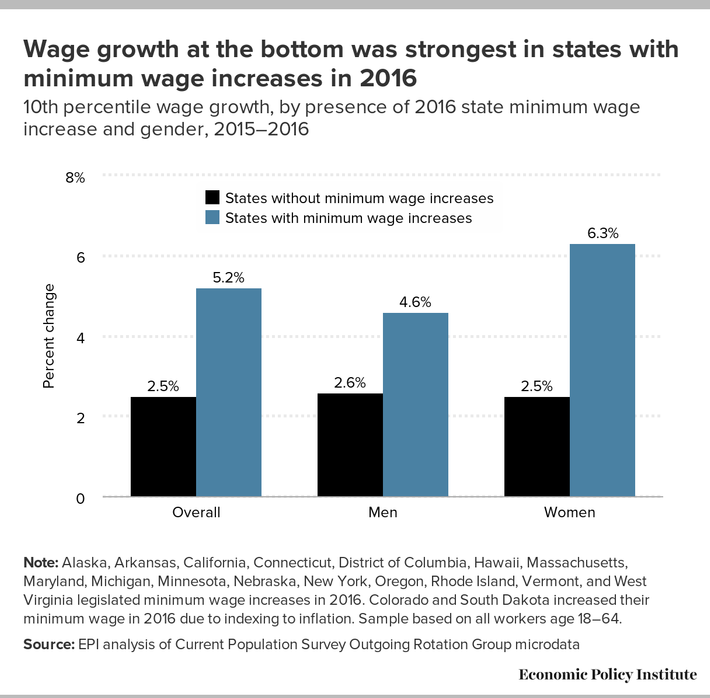 In addition to Berkeley’s work on municipal minimum-wage increases, the Economic Policy Institute has demonstrated that states that raised their minimum wages in 2016 saw much stronger wage growth among workers in the bottom decile of the income distribution. Minimum-wage laws are still an imperfect means of reducing poverty and inequality. They’re difficult to fully enforce, do nothing to help those who cannot work, and do little for underpaid workers in the middle of the income distribution. Direct government subsidies of workers’ living expenses — such as a universal basic income, single-payer health care, or social housing — would likely do much more to improve economically insecure Americans’ lives. And reforms to promote sectoral bargaining or mass unionization would do more to increase workers’ share of their employers’ profits (many Scandinavian countries have no federally mandated minimum wage, as union-negotiated, industry-specific wage floors fulfill the same function). But raising the minimum wage is cheap, easy, and popular. And the weight of available evidence suggests it makes economies a bit less unjust.